Want to learn how to network on Instagram? Social media is not a promotional tool. 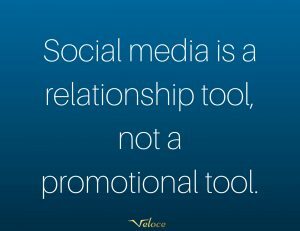 Social media is a relationship tool, not a promotional tool. The social media landscape has completely revolutionized the way we humans communicate, and it has opened up opportunities that we would never have thought would be possible. Today, you can, with the help of social media platforms and the internet, reach people from every corner of the world in a matter of a second. This opportunity of communicating with virtually anyone anywhere is absolutely crazy if you think about it, and if you don’t recognize the immense business potential that lies in communication on social media, you’re missing out on tremendous opportunities. Instagram offers plenty of opportunities to build relationships with people in your industry with which you can develop mutually beneficial partnerships, but in doing this, you need a strategy, you need to know how you should approach people, and how you can use Instagram to do just that. In this article, you’ll learn How to network on Instagram and everything you need to know to do it successfully. I personally cannot emphasize just how amazing of a networking tool Instagram is. And there are many reasons, and factors that go into making it so amazing. Firstly, it’s the fact that Instagram has such an immense number of users. You can find virtually everyone on the platform, no matter who you need to reach out to. Secondly, and this is a huge reason: it isn’t yet as saturated as many of the other social media platforms out there. Well, do you carefully consume each and every email you receive in your inbox? But when email was new, everyone carefully consumed every email they received, even if they were marketing emails. In other words, when we are bombarded with messages, we naturally become more selective of the messages we consume, and since people and marketers are far from taking advantage the tremendous power to network on Instagram, that means the vast majority of people are still carefully consuming each message they receive. Unless you’re talking about a celebrity which receives hundreds of thousands of messages every single day, of course. By using these tactics to network on Instagram, I’ve built relationships with people I’d otherwise never had gotten to know – both in real-life and online, and these are relationships that both have and will continue to be beneficial in the future. Back in the days, the only way to build relationships with people was to meet them face-to-face, and while that approach still remains the most effective and powerful way to build a relationship to date, if you network on Instagram, you can decide who you are going to reach out to, rather than approaching someone in real life and hoping that they’re in the same industry as you etc. Lastly, if you network on Instagram, you can build relationships at scale, and have far more interactions than you would ever have been able to in real life. And the thing is, networking on Instagram goes so much further than just chatting and interacting with your friends. It opens up opportunities for marketing, for relationship-building with prospects potential business partners, and much more. What’s so great about this is that you can identify the right people for you, before you approach them. Safe to say, networking is tremendously important in today’s day and age, and Instagram is an amazing tool for doing just that. The catch is, however, that if you approach people in the wrong way, and if you use the tool in the wrong way, it won’t work. I mean, a screwdriver is an amazing tool, but if you’re trying to use it as a hammer, it won’t be very helpful. Enough of that, let’s get into the more practical part on how to network on Instagram. Obviously, everyone has different reasons and things they are hoping to achieve when networking on Instagram. Maybe you just want to build relationships with industry leaders and authorities so that if, and when, you need something, you can reach out to them because you’ve now befriended them, maybe you’re reaching out to influencers in your industry on your brand’s behalf in the hopes of ultimately getting them to promote your brand and going into partnership with you, or maybe you are looking to network with potential customers, and therefore increase their trust in your brand, and ultimately establish yourself as the go-to choice that’s on top of mind when it is time for them to buy something. No matter what, the approach to network on Instagram looks almost identical. The only thing that will differ is obviously what the message you send them looks like. How you should structure your message and what you need to have in mind when reaching out to people, we’ll go more into detail further on. Since people have different reasons to network on Instagram, the people you will be focusing on reaching out to will obviously be different from the people someone else is reaching out to. Before you can reach out to people in order to network with them, you need to identify them. Fortunately, there are numerous ways you can do just that. The first thing you want to do is define what type of people you are looking for. This will make the process of looking much easier, and you’ll make sure that you are looking at the right places, and therefore have an easier time finding people worth networking with. If you are looking for influencers, don’t just say ”I am looking for influencers”, but rather define how many followers they should have, what type of content they should be posting, and which industry they need to be operating in, and so on. Well, if you’re looking for influencers to connect with, you should be using Veloce Network influencer directory but that’s a completely different story. When you’ve defined your targets to network with, it’s time to start looking for them. Fortunately, Instagram has an effective and advanced search tool that allows you to search for accounts with the help of hashtags, locations, and username. By using these search filters on Instagram, you can search for relevant keywords and topics that are general for the people you are looking for and then reach out to them. 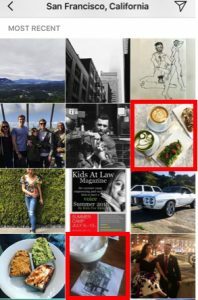 For example, if I am a local coffee shop in San Fransisco and want to network on Instagram with potential customers who might have an interest in my coffee, an approach for me is to go to Instagram and search for ”San Fransisco” on locations. In the results, I’d obviously be looking for people who have posted photos of their coffee. Now, chances are, a lot more of the posts there belongs to people who enjoy coffee, but by going after the people who have explicitly posted a photo of a coffee, you can know you’re going after real coffee lovers, who are more likely to want to try new places to enjoy coffee at. Plus, reaching out to people who have to share a post that shows that they are interested in what it is your brand (or you) are doing allows you to leverage that in your message once you reach out (more on that later). Right from the bat, I found two posts that had a coffee in them, and these would be people I’d reach out and network with if I had a coffee shop in the San Fransisco area. Now, this is just an example, but vision just how big of an opportunity this is, and within how many areas this approach of identifying people that have specific characteristics can be implemented and leveraged for networking and marketing purposes. Hashtags are hands down the single most effective tool for finding suitable users to network on Instagram with, and on a larger scale, hashtags on Instagram is the most popular hashtag system among all of the other social media platforms that use hashtags as a way of sorting content and make it more discoverable. When you’re going to network on Instagram, you’re going to be looking for specific types of people who carry specific characteristics, all based on you,/your brand, and your objectives. The best part is that once you’ve found people that have the characteristics that you are looking for, chances are, you’ll find many more people that carry the same or similar characteristics. This is why Instagram is such a good networking tool because people who are in a specific industry and niche tend to attract people who carry similar characteristics and have similar interests. In other words, people who are in your target audience. Well, begin by using the tactic of search as I mention below to find a prospect. Once you’ve found that person, go through each and every post of theirs. Take a look at every single comment they have received on that post. Chances are, many of the people who have commented will be people who you can network with too, as they carry similar interests. But again, this also depends on what type of people you are looking for and what you’re hoping to achieve. Another similar approach is to go through all the people who have liked the posts of the person you’ve identified as a prospect to network on Instagram with. The same principle as the comments goes here, too. And lastly, when you’ve found an account, take a look at the accounts that are following that account, and the accounts that the person is following. These are two great places to look, as we tend to follow (and be followed by) people who are similar to ourselves. Okay, so you’ve identified a person you want to start networking with, but what is the best way to do it? There really are just two main ways to reach out to a person on Instagram. (There’s sometimes a third, and I’ll reveal that later on). The first way to get in touch with someone is to comment on a post of the person you’re trying to get in touch with. There is a downside to this though, and that is that the comments you leave on a person’s post are open for the world to see, which prevents you from interacting with the person in peace. Secondly, you can only network on Instagram through the comment section of a person’s post if they have a public account, so if they are private, you’ll have to request to follow first. A third downside to approaching people through the comment section is that people on Instagram are far more used to getting spam-comments in their comment sections on Instagram than they are in their Direct Messages, and this might mean that many people will simply see your message as a spam-message and ignore or delete it. What’s more, if you’re reaching out to an influencer or some other person that is somewhat popular, chances are, they receive tons of comments on each and every post of theirs, meaning that your message might get lost in the noise. This is the way to reach out to people and network on Instagram, and it is also the method that is unarguably the most effective method which will drive you the most success. In case you are familiar with Instagram Direct Message, also known as DMs, and in case you aren’t familiar with Direct Messages, there are things you need to know. Despite what some tend to believe, the Instagram Direct Message feature hasn’t existed forever. In fact, Instagram Direct Messages was introduced in 2013 and this was after Instagram had identified a huge need for a private messaging tool on the platform which allowed users to interact with each other undisturbed and privately since the comment sections of posts were the only alternative of interaction back then. You can send Direct Messages on Instagram to anyone, however, when you send messages to people who don’t follow you, your message will show up as a ”message request” in the top right corner within their Direct Messages. If they do follow you, however, your message will be sent directly to you. If you’re reaching out to a large number of people using Instagram Direct Message, have in mind that in order to prevent spam, Instagram has set a limit to the number of people you can send Direct Messages to in a short period of time. The number of people you can send messages to varies from account to account, based on things like how long your account has existed, so if you’re sending too many messages to people within a short period of time, Instagram will temporarily block you from sending Direct Messages. The catch is, you won’t be able to know for how long you are banned. Sometimes, you’ll be banned from sending Direct Message for an hour, sometimes for several days. Therefore, in order to prevent this, make sure you spread out the messages you send to people over a period of time, rather than spam-sending lots of outreach messages within a matter of minutes. A while back, Instagram introduced ”business accounts” on the platform. Among much more, one of the things that were introduced with that update was the ability to implement your email address as a call-to-action button in your profile. So if someone clicks on the button, an email draft will appear so you can reach out to that profile. If a person hasn’t activated their CTA email button, there’s another simple approach to getting their email. You’ve probably come across people who have written their email in their bio description, and maybe you’ve done so yourself. You probably get where I am going with this, but the third way to reach out to people on Instagram in order to network with them is to identify their email address and then shoot them an email. Fortunately, many people have their email address in their profile on Instagram, and this means that you can reach out to many people using this tactic. A benefit of reaching out using email is that you come off as more professional since email is still considered as the more business and professional communications tool. For networking though, email isn’t the most effective tactic, though. Firstly, email is slow, and communication takes a long time. Secondly, when people receive cold emails, they tend to respond to them to a much smaller extent than when they receive them on Instagram. This means that the ”ignore” rate of the messages you send to people on email will be much higher than the ”ignore” rate on Instagram Direct Message. The single most important thing when reaching out to people on Instagram is the first message your reach out to them with. I really cannot emphasize how important this is, and unfortunately, this is where the vast majority of people fall short. And what happens when you’re reaching out to people because you want to network with them, without having trimmed your message to perfection is that they won’t respond. Now, even if your message is carefully written and the best it can be, you still won’t get a 100% response rate, however, the difference between the number of people who will respond will be huge. Now, it’s important to emphasize that the only way to reach out to people to network with them isn’t by sending them a long message that you’ve trimmed and improved. But again, this depends on what you’re hoping to achieve with your networking. For example, if your goal is to just build stronger and better relationships by networking, then the recipe for success is consistent and frequent interactions. Because strong relationships are built after countless and countless of interactions. Just think about the number of interactions and conversations you’ve had with your best friend. On the other hand, if you’re, let’s say looking to network with influencers, you’re doing this with an agenda. You’re doing it because you want them to promote your brand – for free or paid. But either way, no matter if you are hoping to achieve something specific short-term or just want to get to know someone, there’s one special ingredient that ensures the best possible results from your networking and outreach efforts. That secret ingredient is interacting and engaging with them over and over again before you eventually reach out to them. This is when you finally want to ask them for something. Doing this will, once you’re reaching out to them with your message, turn your message into a message from loyal fan and supporter that they know, rather than just a cold outreach message that they’ll most likely ignore. Engaging with the people you want to network on Instagram with before you actually reach out to them will significantly increase your success rate, and so I highly advise you to do this with each and every person. When you’ve done so for a while, you’ll no longer be a stranger, but rather a person who has brought them value before you reachd out to ask them for something. Who are you most likely to help, a stranger who comes up to you and ask you for something, or your best friend who asks for the same thing? Your best friend, of course. And an important reason for that is that you don’t want to risk damaging and harming your relationship by saying no. In many cases, you’ll even feel guilty to help them because of reciprocity since they’ve already helped you and brought you so much value that it would be rude and selfish if you wouldn’t be ready to be there to help them now that they turn to you for help. When it is time to do your outreach message, you need to pay great attention to how you shape it, because this will be of the greatest importance. Now, if you have no interest in asking for something, then you have no need to write a message to send to them, but instead, you can satisfy with simply engaging with them consistently. And the thing is, even if you don’t want to ask them for something, you can still reach out to them to just help them with something to get closer to them, but more on that later. 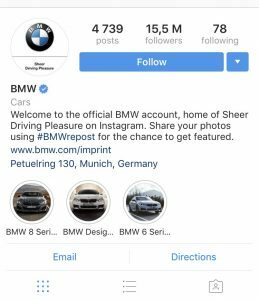 Not only is previous and consistent interaction an important part of greater success with your outreach messages on Instagram, but personalization is also a huge part. The first step to getting people to actually read your message and carefully consume it is to personalize it and tailor it to the person you’re contacting. If your message seems like a spam message that is very generic and doesn’t even include the name of the person you’re reaching out to, the vast majority of people will completely ignore it. If you haven’t put effort into doing the research about the person you’re reaching out to, why would they put effort into reading it and considering your proposition? Therefore, make sure you mention something very specific in the message that truly shows that you’ve been following them for a while and that you’ve done your research. 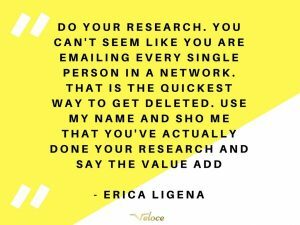 Because just like not having done any research sends a message that they aren’t really worth your time, actually doing the research and writing a personal message will do the opposite, and lead to a much greater success with your message. Personalizing your message is the single most effective way for increasing your read-and response rate, but the thing is, the vast majority of times, you’re not just sending a message in the hopes of getting it read, and getting a response. You’re writing it because you are hoping to get them to do something, or to do something together with them, such as a partnership of some kind. And remember, getting them to do something after having read your message and getting them to just read your message are two completely different things. In order to get them to do something, it is crucial that your message has a value proposition. Personalizing your message is the single most important thing to get your message read, but providing value and having a value proposition is the single most important thing to the message to do what you are hoping that it will do. This is why, without a value proposition when reaching out to people on Instagram to network with, you’ll lose. If someone you barely know reaches out to you, and the first real interaction you’ve had is them asking for a favor, you’re obviously very likely to say no. The reason is quite simple. It will send the signal that the only reason that they’re reaching out to you is that they want something from you – almost like they want to use you. What you need to do is focus on how you can bring the other person value, rather than focusing on the things you can gain from the relationship, and taking advantage of the other person. Identify problems they are facing in their lives, or problems that they haven’t thought about that they are facing, and reach out to them offering solutions. But when doing this, you need to provide value without expecting anything in return. If you follow this tactic with your Instagram networking outreach message, you’ll be surprised at how many people who will respond. That’s because if you provide value but expect something in return, people will sense it, and all of a sudden, your value proposition won’t seem that great after all. And if you don’t provide any type of value, guess what, your message won’t seem appealing, even from the word go. Remember that the only way to network on Instagram isn’t just to reach out to people asking them for a favor of some sort. Good old interaction without expecting anything, and just interacting with people because you want to build strong relationships with them since you share a similar interest is tremendously valuable too. This goes for engaging in real life, as well as engaging on Instagram. A great way to build relationships and engage with like-minded people on Instagram is to join pods or engagement groups. Pods are groups of people in Instagram Direct Message which consists of up to 15 people (the maximum number of accounts that can be in a Direct Message group). Pods are normally focused on a specific topic, just like Facebook groups, for example, and therefore consists of people who are interested in the same niche. The goal of the pod is to draw greater engagement to each other’s posts by letting everyone know every time they’ve shaved a post. When a person has shared a post, they let everyone else know about it, and then everyone in the group goes to interact with it. An important reason for this is to try to ”game” the Instagram algorithm since an important factor for ranking well in people’s feed is engagement, and getting fast engagement. But great pods aren’t just created in order to engage with each other’s posts, though. Successful pods often work very similar to Facebook groups where people ask questions, answer questions, and interact with each other. Therefore, joining pods is a tremendous way for you to build strong relationships with like-minded people in your industry, and rather than having to interact with people one-on-one, you can do it at a greater scale wit Instagram pods. Some people criticise and accuse Instagram pods of being inauthentic and for trying to ”game the system”, but at the same time, when a pod consists of people who are genuinely interested in each other’s work, pods are just a way to make sure that people aren’t missing each other’s content – content that they genuinely care about and are interested in. What’s so beautiful about Instagram is that you don’t always have to be the person who takes the first step of interacting. In fact, if you share great content that’s focused on your industry, you’ll get people who are interested and who are operating in the same industry to interact with you. But in order to do so, you have to make your posts discoverable. Obviously, people have to first find your posts in order to be able to interact with them, right? Now, building an audience is a good step in the right direction. By building a large following of targeted, engaged, and relevant followers, you’ll be able to reach a larger number of people with your posts, and therefore, you’ll have more opportunities in networking with your audience. Hashtags on Instagram aren’t just effective for identifying prospects to engage and network with, but they are also tremendous for making it easier for other people to find your posts, and therefore increase the chances of getting people to take the first step of interacting with you. And remember, every single interaction you have with people is a tremendous opportunity for you to build a relationship with them. Therefore when you receive messages and comments from other people, respond to them! Unfortunately, I see far too many people, including brands, miss out on this tremendous opportunity on Instagram, as well as other social media platforms. It’s like they are running with the football, the goal is completely free, yet still, they don’t take the shot. Respond to each and every single comment you receive, because not only will you show your audience that you care about them, that you value them, you’ll also successively build your relationship with them, in other words, network on Instagram, and before you know it, they’re your most loyal fans, and then when you need to ask them for a favour, they’ll most likely say no, because they don’t want to risk damaging or losing the relationships you have. When implementing hashtags to your Instagram posts, make sure you include hashtags that are relevant to your industry and to the post. Don’t go looking for the ”top 30 hashtags”, because while they may drive the highest amount of engagement, that engagement mainly comes from spambots who have zero interest in your content or page. Therefore, be specific and use hashtags that are truly relevant, because this will ensure that you attract people who are genuinely interested, and will be beneficial to your brand long-term.